Well, Terri, I have to agree with you about your choice and how important the topic of food is! 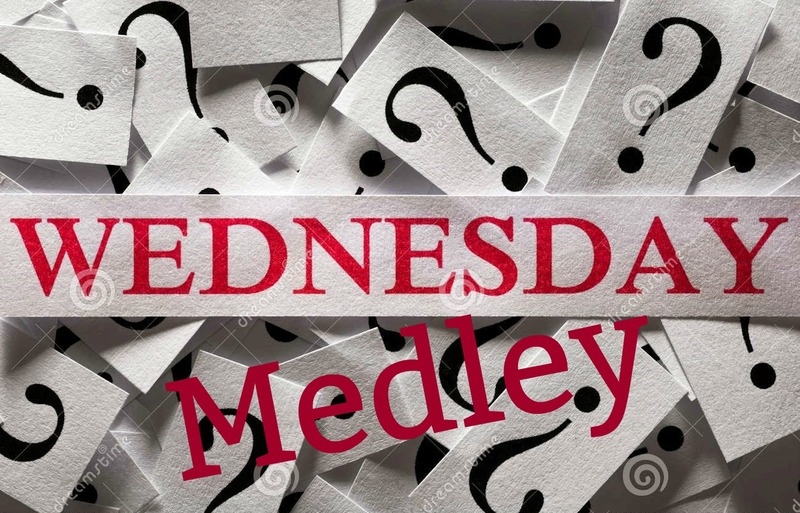 So, in honor of National Frozen Yogurt Day, we grab the questions from Terri for the Wednesday Medley and share your answers with us! So maybe the creator was from a southern state? I like frozen yogurt occasionally, but I prefer ice cream. Hot fudge on top? Maybe hot fudge sundaes or some kind of chocolate cake or brownie with ice cream and hot fudge on top. Oh mercy! I love bread pudding with vanilla sauce. Yum, yum! And some coconut cream pie. 4. Do you like spicy food? I Do! Because it clears out my sinuses? I love Mexican food. What is the spiciest food you have ever eaten? Chicken noodle soup since I never can taste anything when I have a cold. Chicken noodle soup just feels good going down. Yes, doesn’t it always involve food! We had a wonderful birthday celebration for our daughter-in-Law, Amy. Her birthday is today and I haven’t yet posted pictures of our trip to Medieval Times. That was her birthday wish and we had a wonderful time. The food was good, but it was all food to be eaten with your fingers. I drink any alcoholic beverages, but that afternoon, ale just seemed appropriate to drink since we were pretending to be in the days of yore. I ordered a shiner bock (no idea what that was) and took a few sips before I felt wasteful since I knew I couldn’t drink it. During the ride home, I mentioned something to the effect of I shouldn’t have gotten the beer, to which Kate replied, “Nonnie, are you drunk?” That just struck everybody funny and we had a good laugh. The last time we were at Medieval Times was in Branson years ago with all our grandchildren and son's family. I enjoyed it because they were having a wonderful time, but I have the hardest time eating all that food with my fingers. I never tried the beer though. You're a brave Nonnie! Happy Birthday, Amy! Sounds like the Medieval Times birthday party was fun! Happy Birthday to Amy! Medieval Times is always fun!! Happy birthday to Amy! Thanks so much for joining the Medley today! I get hungrier and hungrier with each post I read!! Have a great rest of the week! Oh, Medieval Times sounds like the show we went to with horses (I cannot think of the name) and we had to eat all the food with our fingers. I did not like it at all, wayyyy too messy! :o)) Glad your DIL had a fun birthday celebration. Well you like ice cream, I do too - but I LOVE yogurt. We both do like/love chocolate. Hot fudge. I like spicy, but I have a really sensitive stomach and you love it! Another way we are alike - we are both lightweight drinkers!!!! teehee. Happy Birthday Amy! Happy birthday to Amy! She is beautiful! I love Mexican food too! That sounds really good right now. Loved your answers! Enjoy the rest of your week. Oh, how fun! I always wanted to go to Medieval Times when we lived in Orlando, but never did get to go. I have never heard of Medieval Times. I guess where we live we just don't have those kinds of choices. Probably have one in Orlando somewhere, but we don't go down there unless we absolutely have to. Sounds like fun however. All this talk about food made me hungry. I could use some Mexican food right now. I made myself a hot fudge sundae the other night. Once in a while I just have to. I don't do chocolate/fudge very often, but sometimes I crave it. I love a good tender roast beef/mashed potato and gravy dinner once in a while...or fried chicken too. I did cook a good pork loin roast last night and had mashed potatoes and gravy with that. Does that count? it was good!! Ok, this was interesting. Sorry I am late getting around to reading it. I've been lazy this week on reading/writing. Have a good weekend.